The other day, as you know, I was crafting with my little Bug. 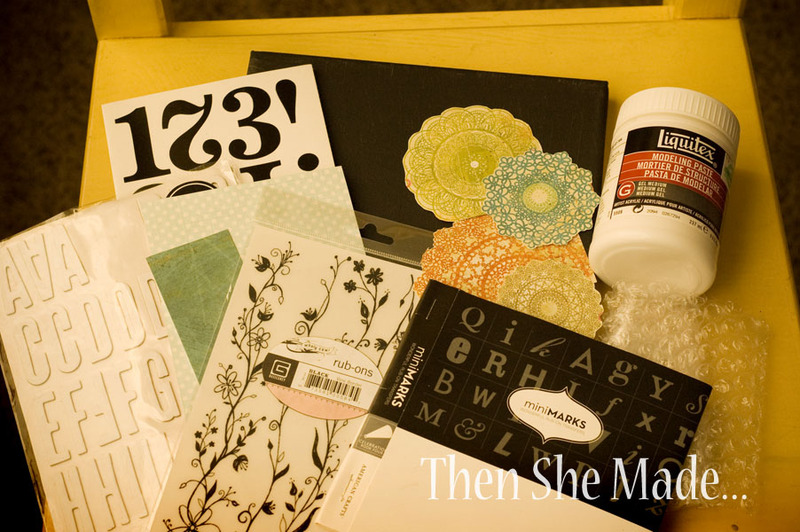 If you missed it you can read about that here: Amnesia & Crafting with My Girls. Little Bug was working on a project of her own and she inspired me to start a project too. It's been awhile since I've sat down, with no plans, or sketches, or ideas already formed, and just created for the sake of creating. But following her lead, that's what I did and it was FUN. I think I need to do that more. 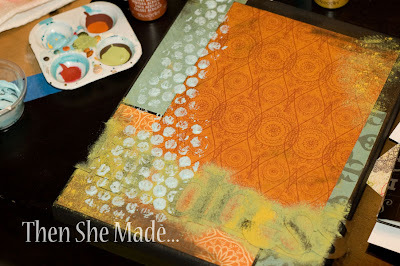 I ended up with a fun mixed-media canvas and I used up some of my stash too. Using my craft stash was something I wanted to work on in 2013 so I'm happy to report I've got one project down and I didn't go to the store once to complete it - awesome! So, have you done mixed-media before? I'm sure there is some formal way to do it but for me, it just means a compilation of several different things grouped together to make art. 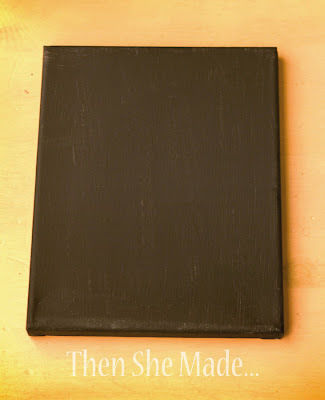 Because it was a project done on a whim I didn't do a step-by-step tutorial but I did capture a few photos along the way and if you want to try and make your own mixed-media canvas you can maybe get some ideas from mine. Again, I'm no expert on this art form but it is fun. So, what supplies did I use to make it a mixed-media project? Start with your work surface. I had some canvases left over from old projects that were already painted black so I just used what I had. Next, adhere your paper in place. I normally would use mod podge but I didn't have any so I just used white glue and let it dry. Use only a thin coat of glue otherwise your paper will warp. 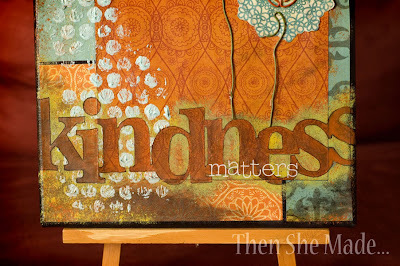 Then I added the word "kindness". I used old Heidi Swapp masking stickers. You stick them down and then paint over them. When the paint dries you pull the sticker off and it leaves behind your design. Here it is while I was waiting for the paint to dry over the letter masks. I also took modeling paste and mixed it with blue acrylic paint and painted some bubble wrap. Then I pressed the bubble wrap onto my canvas to leave the blue circle design. You can't really tell in the picture but the dots, because of the modeling paste, are all raised and have texture to them. Once I removed the masking stickers I took water color paint and darkened the insides of the letters. I also outlined it with a black marker. Then, when it was all dry, I used white alpha rub-ons and added "matters" to the canvas. The final step was adding the flowers which are just scrapbook paper cut into the shape of flowers. I also took paper clips and unrolled them for the stems and added decorative clips for the center of the flowers. To get the paper flowers to stick, I glued them on with modeling paste. The paper clips were hooked on with Dimensional Magic. And, the very last step - I just covered the whole thing with a satin varnish. So, why "Kindness Matters?" because I believe that with my whole heart. 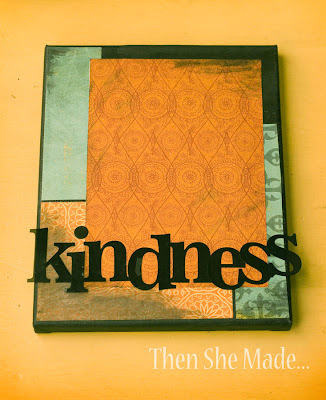 Kindness is something completely within my control and it can change someone else's life for good or at least their day. And if not their day than at least kindness can change the moment you are in. I've had so many moments in my life that I was changed because of someone else's kindness and I can only hope that by being kind, I can have that same effect on people. 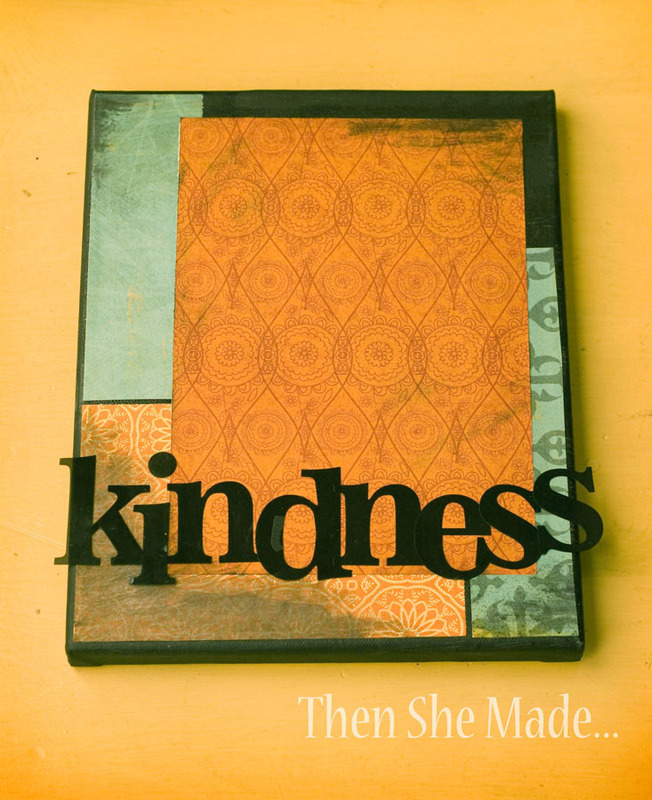 My canvas will hang in my home as a reminder to just be kind because, well, kindness matters! I think your canvas is awesome! We should all have a little more freedom in our creative endeavors. Thanks for the inspiration! It's beautiful!! I LOVE the masked letters & will be giving that a try soon.... 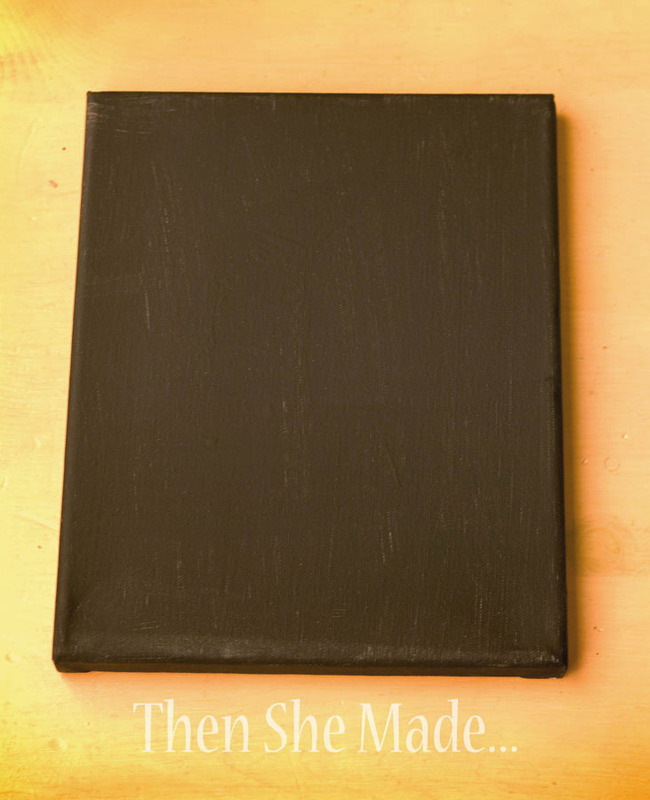 I've had some clearance canvases (ugly pictures, but for $2, cheaper than blank canvases!) for nearly a year now, just waiting for inspiration to hit. You are so creative. While reading how you put it all together I kept thinking "I never would have thought of that". 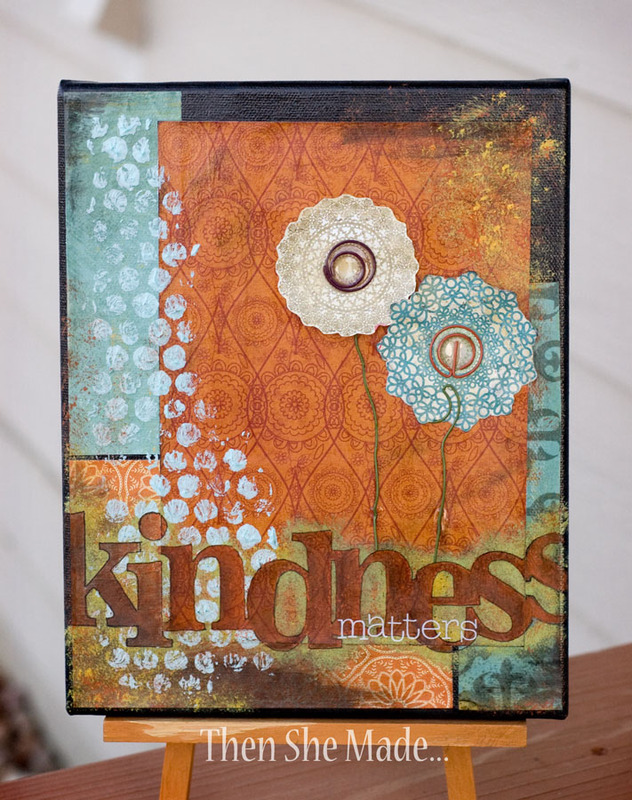 Thanks for sharing your "Kindness"! I am so loving the whole mixed media art techniques. Love how yours turned out, thanks for sharing all the steps. I don't consider myself as much of a crafter but you definitely are inspiring! I fell in love with your sock snowmen and everything that I've seen since! I LOVE this multimedia project and hope that I can attempt something similar in the near future! Can't wait to try something like this for our house soon!